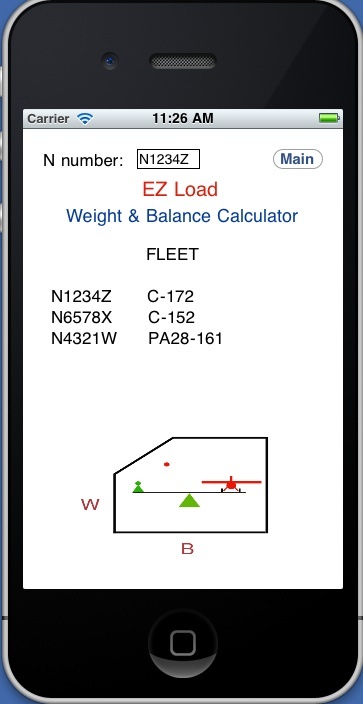 EZ Load V1.1 has added two more line descriptors to the utility / aerobatic envelope description portion so that this CG range can accommodate five lines in all. 2. Delete the updated app from the device. 3. Download EZ Load v1.1. 4. Re-enter the aircraft(s) data as before. If the app is not deleted (which also deletes any associated files) the app will crash. This behavior is because the separate aircraft data is saved on the device as a unique file structure. With the added CG data the file length is not the same as before and if the file that exists for that name (under v1.0) is asked to be accessed under the new file structure (which is of a different length) it will crash the app. Operation of an aircraft within the limits of weight and balance is an important fact of flight. We all know this. Nevertheless it's also a fact of life that many flights are conducted without an accurate check of the weight and balance. A false sense of security borne from familiarity with "similar" loadings tends to creep in. This replaces the actual calculation which may in fact tell a different story. Having ready to hand a means for determining the accurate weight and balance for each flight with its unique loading would obviate this unsafe procedure. In addition to a verification of operation "within the envelope" a visual depiction of the loading engenders an appreciation for the effects on aircraft performance. EZ Load provides such a means. It is intended for the smaller General Aviation aircraft, singles and light twins. 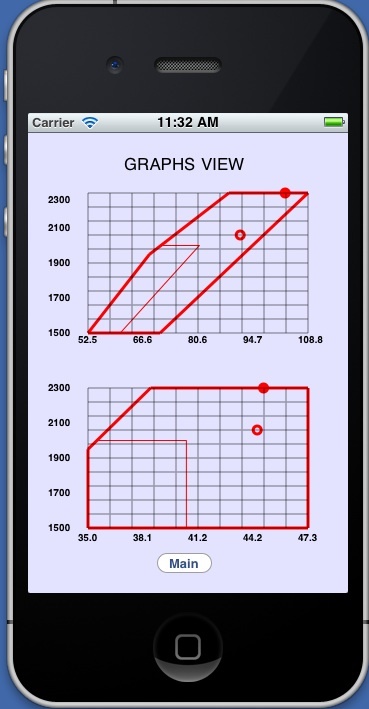 Preset envelope graphs are not used. Instead the user enters the necessary information for each aircraft type. In this way one is not limited to just a few aircraft. The app makes use of four primary views and one auxiliary view: List view, Main View, Graph View, Description View, and Info view. 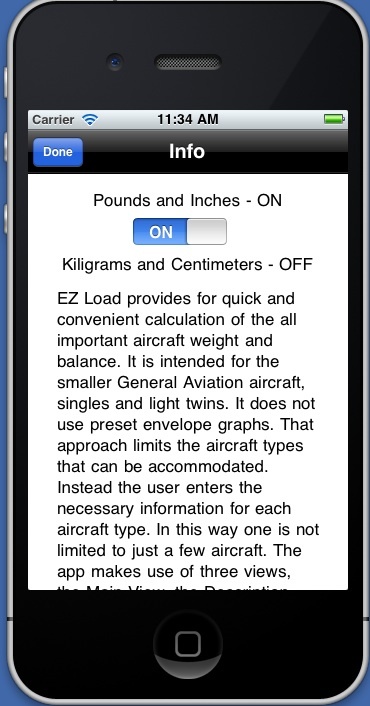 The constant data for a particular aircraft is entered on the Description View. This data is obtained from the aircraft AFM. When the app is opened initially the List view appears. The purpose of the List view is to provide an entry point for the application. 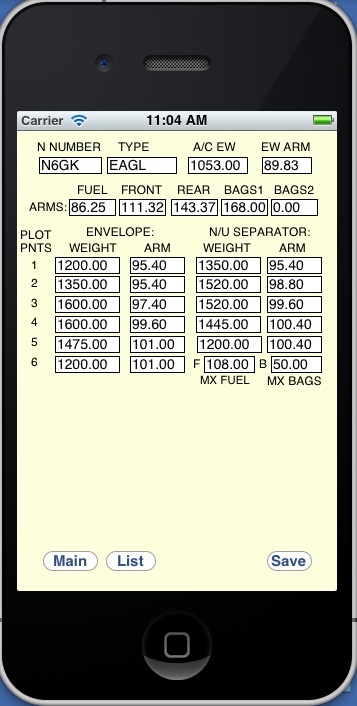 It also provides a scrollable text area where aircraft can be listed for ready reference. A touch in this area brings up the keyboard. To enter a new aircraft a touch in the N number entry field brings up the keyboard. A suitable file name is entered. Of course the file can be saved under any name; it doesn't have to be an N number. It seems natural to use the N number for the file name and the corresponding fields on List View, Main View, and Description View are labeled as such. When an N number (file name) is entered that does not correspond to any saved file, a touch on the keyboard "return" key brings up the Description View. Here the N number is shown and all other data can be entered starting with the Type field. The aircraft Empty Weight and Empty Weight arm is obtained from the AFM Weight and Balance form. The arms or stations for Fuel, Front seat area, Rear seat area, and Bags area(s) are obtained from the aircraft model AFM or POH. A touch in a field brings up the keyboard and the data is entered. The Description View does not show any explicit units such as lb/in or Kg/Gm. Any units may be used as long as they are consistent between the data entered in this view and the Main View. If the data are entered as Lb. and in. 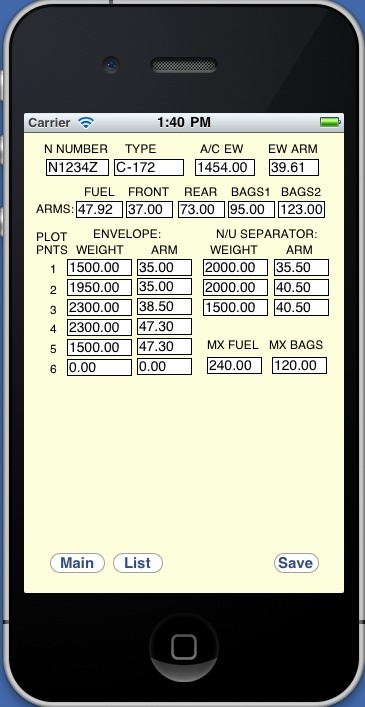 those units must also be used on the variable data entry on the Main View. Equivalently for other units. When all required information is entered the keyboard is dismissed by pressing the "return" key; the Save button is clicked, the data is saved on the IOS file system, and the view switches back to the Main View. The graph envelope data on the Description View must be entered correctly. The data has to be entered sequentially. Plot Point 1 is the bottom left point, Point 2 is at the next vertical break point, and so on around clockwise and finishing at the bottom right point. The two right hand columns, labeled N/U Separator, are to enter the data to show the separation between Normal and Utility or acrobatic categories if the aircraft is so certified. Depending on the aircraft these separator line(s) can be horizontal or vertical. Some aircraft have a single horizontal line, some have a single vertical line and some have a horizontal and a vertical line. All three weight and arm pair fields have to be filled with valid points, no zeroes allowed. The protocol is to enter the points for the horizontal line first and then for the vertical line. If the horizontal line extends all the way across, the third pair just repeats the second pair. In other words that line is just drawn on top of an already existing line and all's well. If there is only a vertical separator line then the first pair should have the top points and the last pair should again just repeat the second pair. The Envelope allows for a maximum of six points; if the envelope needs fewer then the fields are populated from the top down and the unused fields should have zeroes. In words this process may sound complicated but in practice it will be seen to be straight forward. Some aircraft present their weight and balance graph in terms of weight versus moment. The information is equivalent. The graph moment value in pound-inches is converted to the corresponding CG or arm value in inches by dividing moment by the weight of the corresponding moment. If the file name (N number) entered in the N number field on List View is for an existing file, a touch on the keyboard "return" key brings up the Main View where the saved data for that aircraft is filled in the appropriate fields and the proper CG envelope is displayed. The user enters the new variable data and a touch on the keyboard "return" key yields the results. The "Enter" button may also be used to see the results. 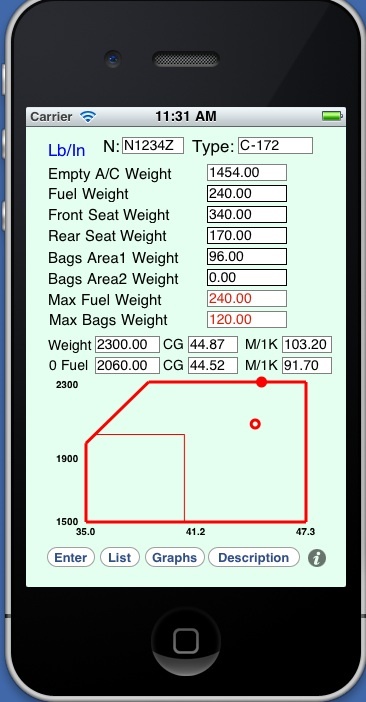 The Main View is a generic view in that there are six fields: Empty weight, Fuel weight, Front Seat weight, Rear Seat weight, Bags 1 area weight, and Bags 2 area weight. Only the fields that apply for the particular aircraft are used; the other fields are zeroed. A touch on the "Graphs" button brings up the Graphs View. This view presents the loading information in terms of Weight versus CG and equivalently in terms of weight versus moment. The units are pounds for the vertical axes, inches for the horizontal axis on the CG graph (lower), and pound-inches divided by 1000 for the horizontal axis on the moments graph. Grid lines and additional axes labeling afford an improved depiction. The auxiliary Info View provides a switch for units. This switch merely determines which of two units combinations are shown on the Main View. This is a convenience reminder that the constant data for a given aircraft is entered in a given way and that the user entered data needs to be consistent with that. It does not effect any internal conversions as none are required. Units can be entered in any way desired, including solar masses and parsecs. They would not be very practical. Additonally the Info View provides a ready reference to the information presented here. Again, as a prudent reminder the following is noted: As true with any computational process the adage, garbage in, garbage out is applicable. It's the responsibility of the pilot to properly exercise that knowledge which has been so arduously learned in ground school.